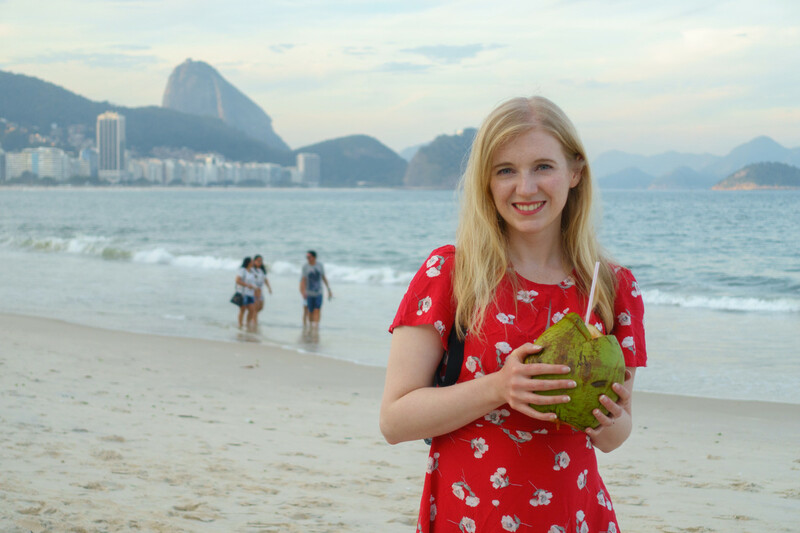 Rio de Janeiro was the place I was most nervous about on our whole South America trip… and that wasn’t helped by the man I sat next to on the plane giving me a long list of tips on how to stay safe in the ‘dangerous’ city! However, I needn’t have worried. 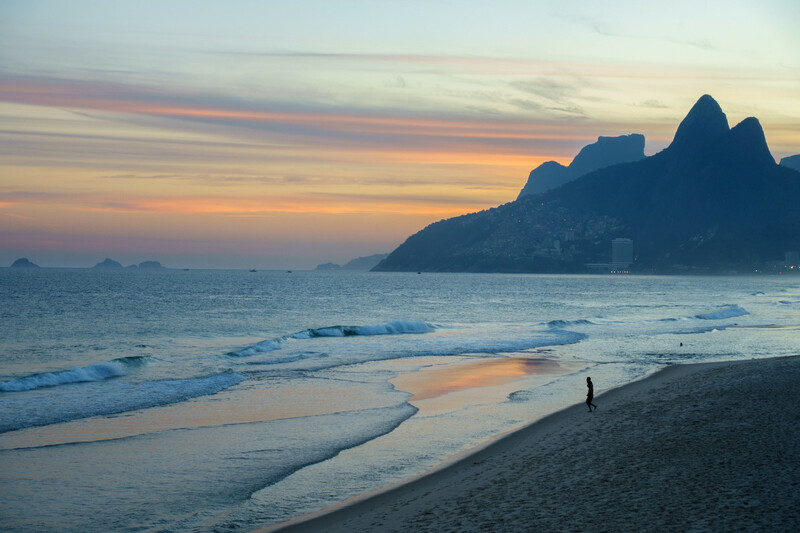 My lasting impression of Rio is one of a vibrant city with beautiful beaches, fantastic food, and incredible views. Following our flight from Chile, we arrived at the Americas Copacabana hotel at around 3.30am. Needless to say, we were pretty tired the following day. Thankfully, the hotel served its large breakfast buffet until 10am and we sloped downstairs to eat as late as we feasibly could. After breakfast we walked from our hotel to the famous Copacabana Beach. 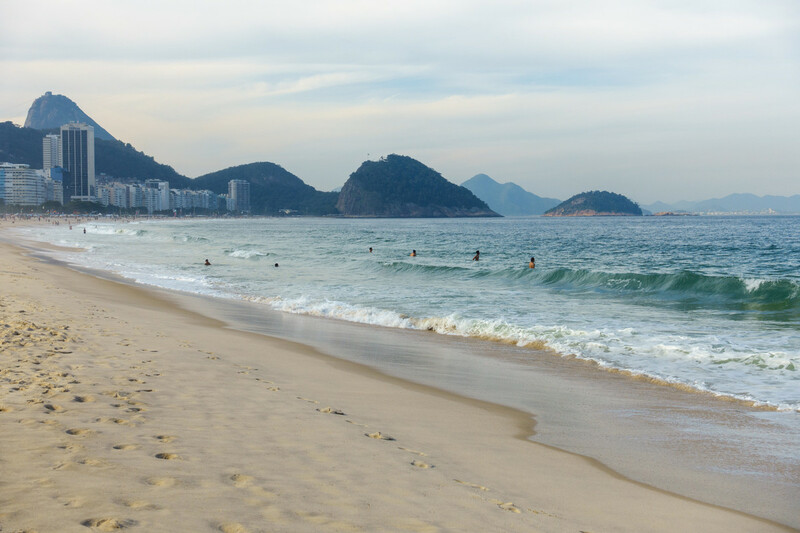 Here we strolled down the wavy pavement of Avenue Atlantica, past the famous Copacabana Hotel, and down onto the sand. 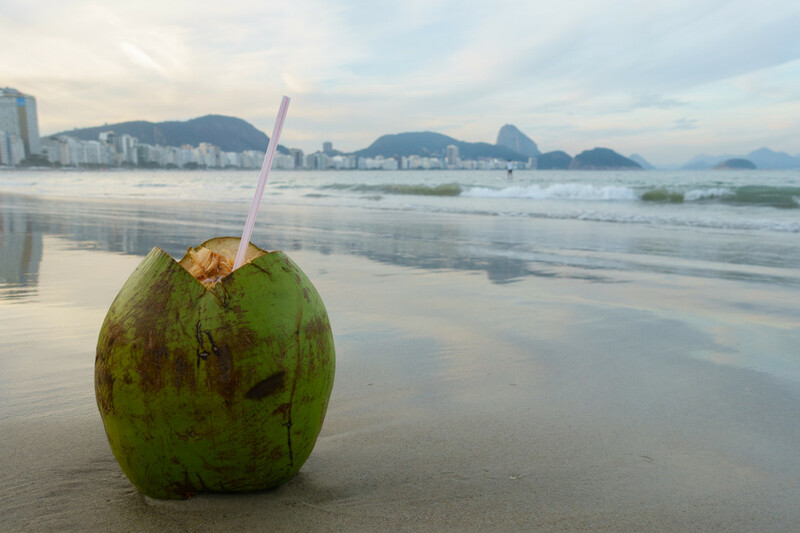 We stopped at one of the many beach bars to buy a coconut water and a beer, and sipped on them while admiring the classic views of skyscrapers and Sugarloaf Mountain from the shore. 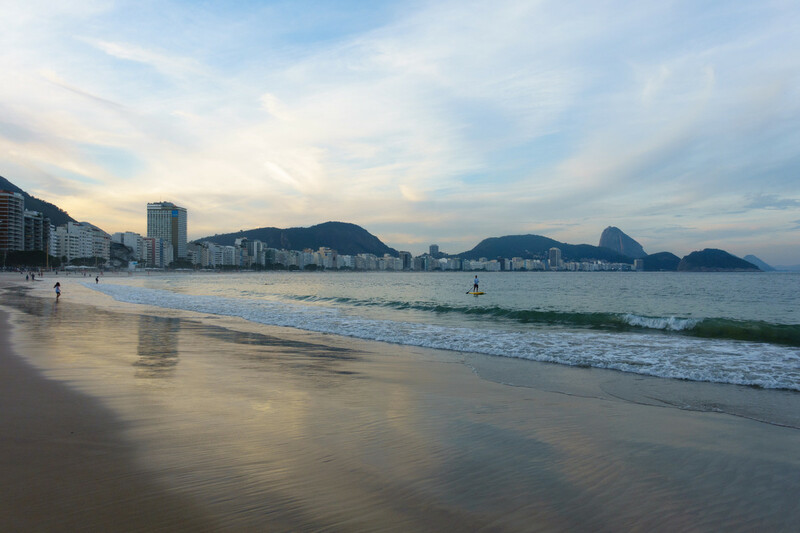 Having relaxed on the sand for a bit, we continued walking south along the coast towards the upmarket neighbourhood of Ipanema. 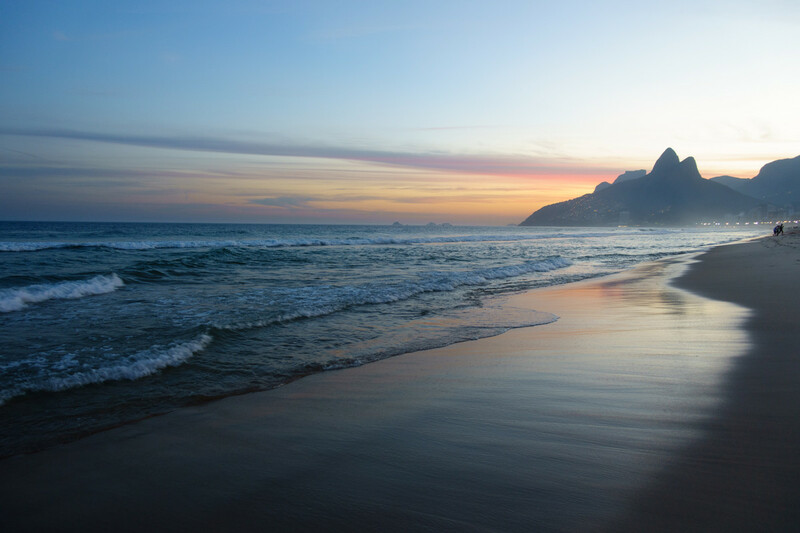 We reached Arpoador Beach just as sunset was beginning, and the colours in the sky and sea grew more and more stunning as we crossed Ipanema Beach. Eventually we turned inwards to walk around Ipanema, past its bars, shops, and grand, gated residences. We made a brief stop in a Delirium cafe bar, where Steve had one of the hundreds of beers on offer and I had a caipinihra. Many restaurants were shut because it was Monday, but fortunately we found a delicious meal at Casa de Feijoda. 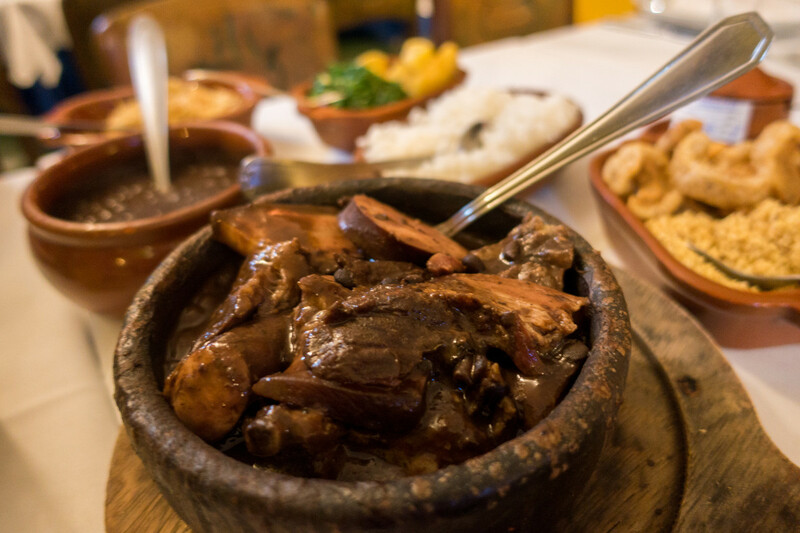 Feijoda, primarily a casserole of different cuts of pork and black beans, was the first thing I’d wanted to try since arriving in Brazil. 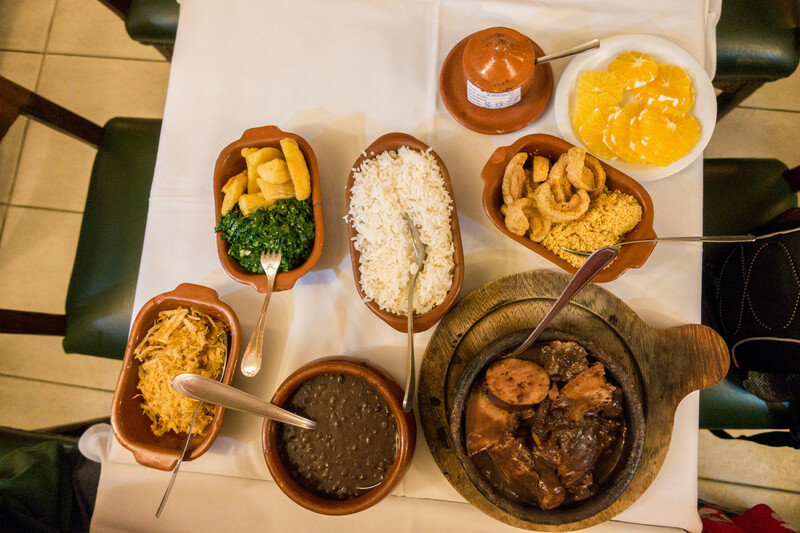 Here it came with the full works: small servings of bean soup; a passionfruit cocktail and a lime cocktail; the black bean casserole with your choice of meats; rice; plantain chips; kale with garlic; pieces of pork crackling; cassava flour; and orange slices. It was amazing, but far too much for me to manage! Fortunately Steve (who had his own dish of filet mignon with cheese sauce) was able to help me out and join in with the accompaniments, despite us only paying the feijoda price for one. We were told that anything we finished could be refilled, but we didn’t even come close to finishing anything! Thanks to the the unexpected cocktails in addition to the wine I ordered, I ended up quite drunk. We got an Uber back to our hotel, and had no problem falling straight to sleep. Tomorrow, we planned to go ‘full tourist’ with a walking tour of central Rio, and visits to Christ the Redeemer and Sugarloaf Mountain. To be notified when the next post goes live, subscribe to this blog or follow Roam with Juliet on Facebook. 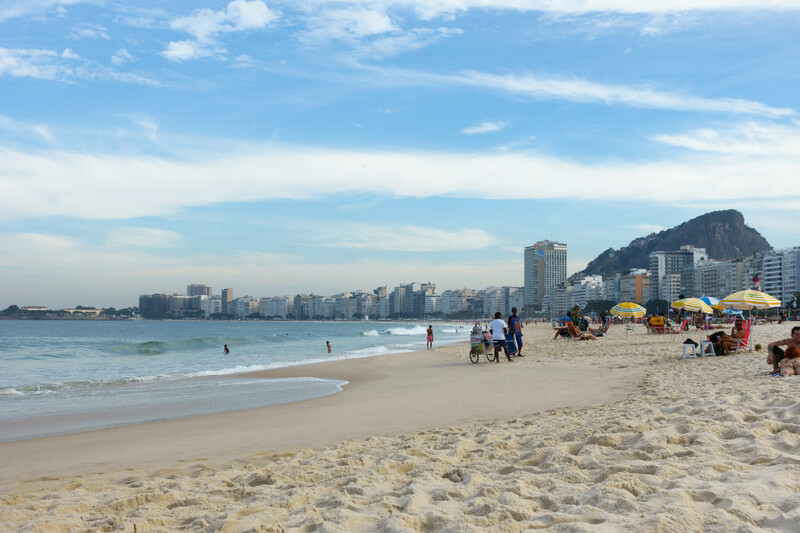 Posted in Brazil, Photography, South America, TravelTagged copacabana, feijoda, ipanema, RioBookmark the permalink.